Birthplace: Presumably somewhere in southern Sanctimonia. Body Type: A fit, but not muscular mesomorph. Distinguishing Features: Tattoos of odd shapes, discolouration and brightness of eyes. Deity: Aten, God of purity, purification by fire and the Sun. If you're a traveller that values information around these parts, then you might have heard of a man they've been calling 'D' in the past few decades. The warrior of light and purity, they say. I say. Let me spin you a tale of this bounty hunter. Demetrious was born thirty-nine years ago somewhere in southern Sanctimonia at an unspecified date. His story began as a newborn, albeit not your typical beginning. His first months on our doomed world have all boiled down to one "last" moment for the child. He awoke crying and freezing in a patch of moss covered by snow, underneath some forsaken tree. A newborn wrapped in nothing but a thin blanket during the winter months, deep inside the forest that happens to rest near the top of a high mountain has no chances of survival whatsoever past an hour. At least, that's what most people believe. Putting all of that aside, one thing's for sure. Demetrious was very lucky that day. On the evening that sparked his future, four men dressed in robes were returning to the nearby Church of Aten, escorted by three guardsmen from the nearby settlement. One of the four followers heard the gut wrenching sound of a child in pain, crying as loud and as hard as he can, even at that age. Without a second thought, he followed the source until he came across our young hero. He picked him up under his arms, yet he continued crying. His skin had turned in to what appears to be a violet tint due to the long exposure to the cold. The child's eyes are seemingly frozen in place, the frost having an effect on the tears he released from his young canals. The monk stood still with his mouth wide open. He didn't know how to respond to such a miraculous sight, and continued to stare down the nearly dead child, his robes flailing in the wind wildly -- casting the snow on the ground in all directions. The second man, his brother, stood behind him and took him by his shoulder. "We need to go. Put him under your robes and let's take him with us," is what he said. Those few critical words saved many lives when they were spoken that day. More than the young monk could ever imagine. This sentence is followed by a quick nod, then by their swift return to safety, barely trenching through the snow. The guards questioned their motives, not quite having such internal moral capacity as the celibate monks, but they followed their requests. And this, is how the infant we know today as Demetrious was saved. But that's hardly where the story ends. Demetrious was on the verge of death, his spirit stood at the edge of a giant drop, all he needed was a small gust of wind to send him tumbling. Of course, that didn't happen. He unexpectedly turned for the better, and as any obligatory moral establishment such as a monastery, they took quite good care of him until his parents came to claim him. That never happened. One monk suggested that they left him there purposely to die, that no one would do such a thing to a child, or even take him out in such weather conditions. "Nonsense," replied Demetrios' saviour. He did not believe such people would have the right mind to do so in those calm parts. Days passed, then weeks, then when the threshold for months came, they made their decision. They would accept the orphaned hero as one of their own, and push him in to religion and celibacy at an age where he could not even eat without slobbering. Castration and the holy rituals of acceptance soon followed, and he became a pledged monk of the Order of Aten. Life seemed simple from here on, but it was far from that. Many trials await our hero in the future. Not much can be said about a monotone life of a shrine monk. His life continued onward, he sucked up any knowledge he could find, eager to learn more at that age. He learned the customs of the world and he learned to embrace his God, Aten. Over the course of approximately fifteen years did this continue -- learning the magic arts of light and the holy. His life was peaceful and sheltered, he believed this is all the world had to offer. He honestly believed that there are no bad people walking on our land. These days, he often times thinks of how naive and foolish he was as a teenager, due to what followed soon after. Disaster struck the monastery. The youngest brother of the Followers of Aten, our hero, Demetrious, was haunted by a Revenant. This is a dark creature, a powerful creature that took hold of his mind, even if not literally. He became obsessed over it, temporary schizophrenia followed in its wake. He crumbled under the pressure, wanting the most horrible thing a holy man could wish for. Death. He assaulted his brothers, with the revenant almost mockingly positioned behind him the whole time. The descriptions of the only monk that witnessed it go as follows: "He opened one of their abdomens with a cooking knife and cut the other one to the point of blindness. He was insane," were his claims. Dubious are the words of this man, as the other monks reported seeing him in several locations at once when that took place. Either way, we'll never truly know what exactly happened with Demetrious and those two celibates, as both were burned by him in that state. Immediately after that, since the corpses were obviously discovered, they refused to enact any sort of punishment. They returned him to the wilderness in the same manner that they received him. They pushed him back in to the world. When he had awoken, shivering and freezing, he knew not what to do. As terrified as our would-be-brave hero is, he can't help but laugh. He shifts on to his knees and starts laughing quite heartily for about a minute or so. Why? The revenant was gone. Why, how, when, nothing is ever elaborated on, not that it needs to be; he believed the vile creature would be the bringing of his death, not cold or dehydration. Stepping on to his feet, he realises his wrists are tied together with rope. He struggles, oh yes, he struggles -- but to no avail. They made sure he couldn't murder any more people. Knowing he can't turn back and knowing he won't survive for much longer by standing around, he starts moving, this moving then translates in to pacing, and finally in to running. He runs for approximately two hours straight, completely exhausted and completely spent. When he reaches the peak of it all, when he's about to give up, a road is dropped right in front of his face. He falls on to it, unconscious and asleep. Here is where it all changed for our hunter. Not an hour later is his nearly dead body found again. Four people stepped out of the sumpter-mounted carriage, he recalls nothing but fair murmurs in his presence, his unaware mind not being able to form any comprehendible words. They drag him inside after a minute or two, treating his wounds, giving him water and warming him up. Once again is his life saved by complete strangers, a lucky thing indeed. As soon as they nurse him to health, he's quick to ask questions, still as ignorant as ever. They take him under their wing upon hearing his story, even if he does fail to mention the fact that he murdered two holy men in cold blood. Time, once again, begins to pass quickly. They unravel countless mysteries over the years, defeat many foes and earn a lot of money for themselves, of course our hero does none of this, as he is unexperienced in combat. That's why, feeling that he would be a good successor, the newly made friends take him under apprenticeship, teaching him their ways for nearly a decade. The oldest of the four uses their time spent together to teach him the most cursed and the most evil of tongues, Demonic. The second one preaches to him of controlling spears and staves, how to properly combat and throw using one. The third one would teach him the art of abjuration, how to control kinetic energy and how to shield himself from any possible foes he may face in this wretched world of ours. The fourth does nothing more but keep him company, as he is of the same age, perhaps even his rival. These men were his family, his only family. Demetrious felt distanced from the monks, none of them communicated with him on a personal level like these people did. Though he never dropped his beliefs. He continued praying to Aten, trying to amend for his sins every single day of his entire life through prayers and actions. He remains celibate, while the rest of his companions use the brothels and taverns for enjoyment, he prefers to read books or do something else to pass the time. This also leads in to a different method of "bounty-hunting", and is the first time that he had done anything differently than what he has been taught by the people he considered friends. He refused to attack any being that he does not deem evil, as twisted and as broken as that logic may be, it is what carved our hero in to the man he is today. Finally, it comes. The last turning point in his life to date. After nine years, at the age of twenty four, the representatives of their clan bite off a piece that they just can't manage to chew. Not much is known about what happened, even to a man like myself. It involved one of the most terrible creatures imaginable. The Inklings. The hunters were sent on a mere "clear and run" assignment, deterring any lowlife evil out of the nearby caves. They didn't know what they were walking in to, however. They quickly managed to get surrounded and outnumbered by many fold. Two of the five managed to escape. The last one died through infection caused by a wound given to him by the Inkling monstrosities. Once again, Demetrious saves himself, whilst only one of his "family members" are spared the leisure of a free soul. From that point onward, he has been travelling from city to city, settlement to settlement, doing his best to overcome the troubling issue of magicians and creatures that roam free and kill the innocent populace across the land -- stories that would take much longer to tell. Strangely enough, he has never returned to the monastery in which he was raised -- a man of such chivalry would be expected to do so. He has made a name for himself in many locations across the mainland, and now his travels lead him to the city of Surna, where he hopes to do his best in continuing to rid the world of evil. I will write the biography of this man for as long as I live, and for as long as his tale continues. His religious nature allows him to harness powers which he believes to be from the God himself -- Aten. He manages to use these powers in spellcasting. Not only this, but religion allows him to have a much more level headed mind, allowing for out-of-the-box thinking in dire situations. 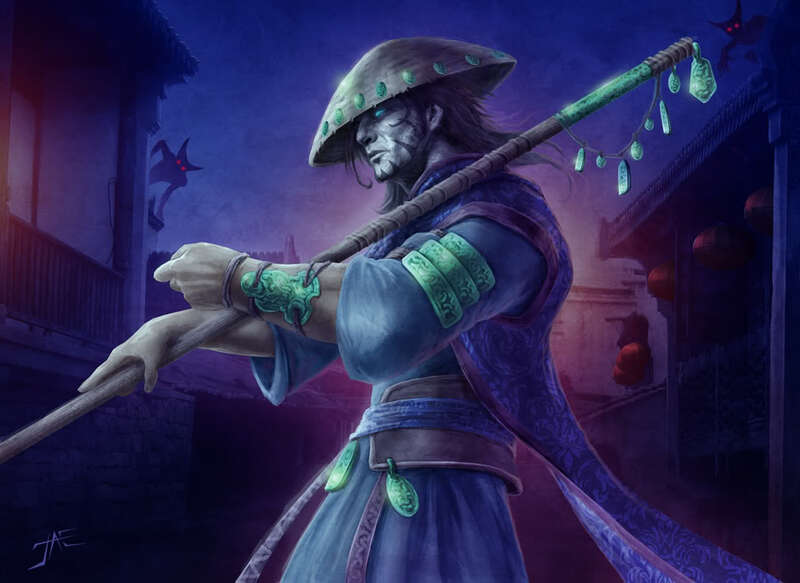 Whilst he excels primarily in throwing the spear at his enemies and throwing it accurately, his staff allows him to defend himself at close range. Offensive attacks aren't his strong point, he's taught himself how to deflect against any stabs or slashes coming his way, but that's about it. He doesn't rely on using the spear-staff in close proxmity as much as he does on using it to defend himself or throw it at an enemy. He is a thrower without comparison however. Due to the many locations he has trenched and due to the many times he faced near death, D has learned how to survive in the toughest of environments. This spans from knowledge of local plants to avoid poisoning, all the way up to a good sleeping platform on a tree. His light weight equipment and the need to move around a battlefield quickly have caused him to develop a high enough speed and agility needed in a combat situation. Running down his targets is the first step in finishing a contract. It is a necessity to have the competence to do this or else an elusive target would simply escape from your grasp. Knowledge is power. He has a wide array of information saved in his own mind; about forms of spellcasting, threatening creatures and so on and so forth. Being prepared is key to a safe and successful assignment as a bounty hunter. Due to extensive activation of holy magic, like the rest of his cavities, his eyes have become a rather gate for light to escape his body. This has permanentely mutated his eye, causing him to see a much more drab, blue texture whilst allowing him to see much easier in the night, not even comparable to that of a normal human's night vision. Quality of life has deteriorated with this, however it makes any travels at night much easier and much quicker. Of course, it would only be obvious that hunting was one of his trademark skills. Combined with his survivalism, tracking and acrobatics, it's apparent that he is crafted for such a duty. Capable of shadowing his prey until an opening for a safe attack is in front of him, along with many other traits that apply to this skill, this is the main element used in his occupation, and most notable of them all. This spell has a very fast incantation Sigellum, and it has different versions. He can indeed use telekinesis to lift objects at random, or push objects away, but the most common form is the one he uses for assassinations -- the thrust. Whilst throwing his spear weapon, he's also fully capable of using his telekinetic prowess to massively increase the speed at which the projectile is flying. This spell is much less requiring in comparison to the others he practises, so he carries knives for this use in case he's far too exhausted to forge a spear in his palm. This spell involves a short Sigellum, it creates a bright white spear in the hand of the caster. This spear does not take the shape of a normal one, rather than that it twists and bends erratically, almost like lightning. Abjuration magic is used to propel the spear forward, not just the sheer physical strength of the caster, causing it to travel at high speeds. If the target proves to be weak against Holy magic, for example if the target were Vampiric, the spear would start to burn and eat away at the flesh around the point of contact at a fast pace. This would not happen for long, however, because the charged energy in the spear would disperse quite quickly when released from the hands of the caster. The caster "writes" a Sigellum on the ground and mutters it at the same time. A short delay occurs, before an invisible bubble surrounds the caster. The longer this bubble is up, the more exhaustion it causes upon the caster. This bubble protects from any sort of magical attacks. Any sort of physical attack would simply pass through (note: if the weapon has an offensive enchantment, this enchantment would be nullified inside the bubble). When a magical attack strikes the bubble, it exhausts about 1.5x the amount that it took to cast that spell, because the energy from the offensive spell (i.e. a fireball) has to be absorbed somehow. This bubble is not a perfect protection, especially if the opposition is more powerful than you are in terms of spellcasting strength. For this spell to hit, it requires a specific direction and a moving object. The friction of this object (a human, for example) would increase on the surface, causing them to massively decrease in speed. They would feel as if they were walking/running through syrup. This spell is difficult to cast because it requires the target to be still and the caster to be calm (cannot be cast late in to a battle). This power comes from provoked anger inside the caster and requires a spoken (or rather yelled) Sigellum, as that is what fuels it. The impure cordonium crystals across his body and on his staff start to shine very brightly, the main source of light from the tip of his staff. As this spell comes from within, the skin of the caster would shine white and any sort of opening (nose, eyes, mouth,...) would emit this light as well. The intensity is dependant on how much power the caster pushes behind the spell and the incantation. If an unholy creature such as a werewolf would be hit by these beams of light, it would start to burn their body of varying intensity. To any normal creatures of the realm, it would feel hot and they would most definitely not be able to see in the general direction of the light. This spell is unstable and potentially dangerous to the caster if not mastered. Impure cordonium crystals and bars that cover his entire body. These have been modified for his personal use. Since the extremely cheap and impure cordonium on him isn't capable of storing magical energy, he employs it as a conductor, using it for offensive spells such as his "blinding light" spell. These are the robes and headgear that Demetrious managed to get a hold of from his fallen comrades. They are the traditional clothing of their clan. He wears them to honour their memory. Covered in cordonium mentioned above. By far the most valuable item in Demetrious' possession. This staff has several bars and crystals of cordonium attached to it either by force or by string. The staff itself is made out of hardened acacia wood. On the other end of the staff, is a spear that would almost look like the end of a short sword due to its rather unique shape. It's crafted from a fine titanium steel metal, the edges luminescent -- they're covered in lucium. This staff was taken off of a fallen foe several years ago, the name has never changed. It has been customized and added on to for D's use. This is by far his most valuable posession. Made out of simple iron, these sharpened tools are used as the least costly form of assault Demetrious has, as a telekinetic thrust (see spell section) is not a very demanding spell. He always carries about eight or so, attached to his back. A simple pouch strapped to his side, it holds general medical herbs which he purchased in case they were required, some energy food such as berries and all the shillings he has on him. A leather backpack he has strapped on to his back when travelling, since he always rents a room in any settlement he goes to, he's rarely seen with it unless on the move. Inside are his personal belongings, clothing, and so on and so forth. *Things are subject to change if I forgot something or need to edit some things in or out, but this is how the character sheet will look in general. I think I'm done now. And yes, the biography is supposed to sound like it's exaggerating and dramatic. I'd really appreciate some feedback here guys :(, whether bad or good. It could be that the forum is slower than I believed it to be, but still. For one thing, huge backstory is huge. Seems that quite a bit of effort went into him, but I'm a tad apprehensive of this. While he's very specialized, he still seems extremely powerful to begin with. None of his abilities/skills are likely under an adept level and his staff is pimped to the max. Cordonium and Lucium, I believe, are supposedly very rare and thus extremely expensive. It's unlikely he'd just find it off a dead foe unless their pavement was made of diamonds or something. I'm hesitant about the amount of cordonium, because of both their properties and cost. And I also worry that his skills are very high, what with 9/10 and 8/10 being the sort of values you'd see on a special character's page. Then again, he is a good guy at heart, and the page is disgustingly good. By far the most valuable item in Demetrious' possession. This staff has several bars and crystals of cordonium attached to it. The staff itself is made out of hardened acacia wood. On the other end of the staff, is a spear that would almost look like the end of a short sword due to its rather unique shape. It's crafted from a fine titanium steel metal, the edges luminescent -- they're covered in lucium. This staff was taken off of a fallen foe several years ago, the name has never changed. It has been customized for D's use. Off the top of my head, I think you could consider removing the blade on his staff given his power in magic is supposed to be balanced by his shortcomings in melee. I really don't plan on playing him overpowered and I trust myself to roleplay him responsibly, not a tank. But I'll lower the skills, I have a lot of problems when it comes to gauging these things in applications, to be quite honest those "bars" are more for appeasing to the reader instead of actually display what the level of my character is at. I understood that extremely impure cordonium is quite easy and very cheap to to acquire (correct me if I'm wrong), the cordonium on his body is not used to store any sort of magical energy, it's just an exit node for one or two of his spells (when he pushes "light" out of himself, he does it through the cordonium). That's why I thought it'd make sense if I had one "valuable" or "unique" item such as the staff that I wanted to use, because thinking logically, someone that risks their life for a living would have more funds to purchase or modify weapons than your typical trader or guardsman. I was running on the understanding that everything on me is more or less worthless, since the cordonium has no practical use outside of being "the end of a barrel" in my spellcasting, so I decided to stabilize the idea that he lives in poverty with that staff. I don't understand how certain characters start out with having sets of armour, which I assume would be more costly than this. I don't have a problem changing it if it's an issue. Like I said, I trust myself to roleplay his capabilities responsibly, even if you don't :P.
The lore on Cordonium can be found here. Cordonium's primary use is to store magical energy, and that's pretty much all it can do. Using Cordonium to "push spells out of himself" is like using a battery as a transformer. If you want something to be able to transmit magic, look to one of the magical metals. Also note that Cordonium is extremely rare, which would make even impure crystals difficult for a poor person to acquire. Alright, thanks for your input. It is with deep regret I move this character to failed, as per request.